The Capel Garmon War Memorial commemorates those men of the area who died during World War I amd World War II. The memorial takes the form of a standing, stone Celtic Cross, sited in the corner of the churchyard of St. Garmon's Parish Church at Maes Llydan. Capel Garmon is a village in the community of Bro Garmon in a rural area of the County Borough of Conwy near Betws y Coed. Until 1974 the area was part of historic Denbighshire, and between 1974 and 1996 of the county of Clwyd. Denbighshire Yeomanry 6 Nov 1917 25 Born in Cerrigydrudion. Son of Hannah Davies, of Ty Canol, Nebo, Llanrwst, Denbighshire. Brother of John Owen Davies (below). Beersheba War Cemetery, Israel. (13th Bn.) 22 Apr 1918 27 Son of Robert & Elizabeth Davies of 3, Mountain View, Capel Garmon . Also commemorated on the Llanrwst War Memorial. Pozieres Memorial, France. 106181 1st Canadian Mounted Rifles (Saskatchewan Regt.) 7 Nov 1918 31 Son of Mrs. Hannah Davies, of Ty Canol, Nebo, Llanrwst, Denbighshire, Wales. Brother of Edward Arthur Davies (above). Edmonton Cemetery, Alberta, Canada. (1st Bn.) 21 Mar 1918 32 Son of Griffith & Jane Edwards, of Garth Aran Cottage, Betws y Coed. Pozieres Memorial, Somme, France. (1st Bn.) 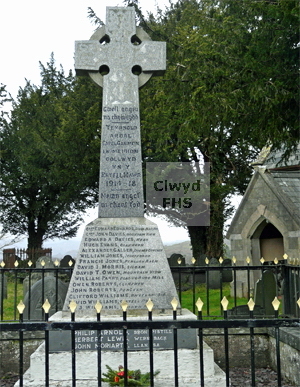 6 Nov 1918 26 Son of William and Hannah Evans, of Glan y Wern, Pentrefoelas Road, Betws y Coed. Villers-Pol Communal Cemetery Extension, Nord, France. (16th Bn.) 10 Apr 1916 22 Son of Edward Alex & Mary Valerie Gallen, 1, Dylassa Cottage, Penmachno. Guards Cemetery, Windy Corner, Cuinchy, Pas de Calais, France. (9th Bn.) 20 Aug 1918 31 Penllan Bach. Born Pentrefoelas. Brother of Pierce Jones, of 21, St. Bride Street, Liverpool, England. Native of Toxteth Park, Liverpool. Cologne Southern Cemetery, Nordrhein-Westfalen, Germany. JONES Son of Hugh Parry Jones & Hannah Jones, Minffordd Capel Garmon. (10th Bn.) 30 Mar 1916 23 Son of William and Margaret Morris, of TÅ· Canol, Siloam, Betws y Coed. Also commemorated on the Llanrwst War Memorial. Menin Gate Memorial, Ieper, West-Vlaanderen, Belgium. King's Shropshire Light Infantry 9 April 1918 25 Son of John & Elizabeth Owen, of Mountain View, Capel Garmon. Also commemorated on the Llanrwst War Memorial. Ploegstreert Memorial, Hainaut, Belgium. PARRY Son of John & Mary Parry, Plas yn Rhos Mill, Capel Garmon. ROBERTS Of Penllan, Capel Garmon. ROBERTS Of Glynfryn, Capel Garmon. (10th Bn.) 19 Feb 1916 20 Son of Elias & Margaret Jones-Williams, of Meadow Bank, Llanrwst. Also commemorated on the Llanrwst War Memorial. Spoilbank Cemetery, West-Vlaanderen, Belgium. WILLIAMS Of Castell Pwt, Capel Garmon. 116820 Royal Field Artillery ("C" Bty. 34th Bde.) 20 Sep 1917 22 Son of Mrs Catherine Morris, of Tyddyn Iolyn, Capel Garmon. Also commemorated on the Llanrwst War Memorial. Tyne Cot Memorial, West-Vlaanderen, Belgium. ARNOLD Of Bron Pistill, Capel Garmon. (7th Bn.) 17 Jul 1944 27 Wern Bach. Son of Charles W & Annie Lewis; husband of Sarah Lewis, of Betws y Coed. Banneville-le-Campagne War Cemetery, Calvados, France. (4th Bn.) 21 Sep 1944 19 Son of James & Kate Moriarty, of 2, Llan Isa, Capel Garmon. Valkenswaard War Cemetery, Noord-Brabant, Netherlands.